Antique Hostel is perfectly situated in the heart of Bucharest’s historical downtown area in a beautiful early 1895’s floor house on shore “Dambovita” river (which crosses Romanian capital Bucharest) and just across a very beautiful building of the Palace of Justice, near the main points of interest, like the Parliament Palace (you can see it from the balcony), Unirea Shopping Center, Old Town (1 min walking), National History Museum, Old Princely Court (built as a place or residence during the rule of Vlad III Dracula in the 15th century) with a fully renovated interior and just 1 minute walking distance to the amazing nightlife and also to good value Romanian restaurants, bars and pubs in the Old Town. The comfort of our guests is our priority. We have different type of rooms, with balconies or big windows, with comfortable beds, fully-equipped bathrooms, common rooms, a spacious kitchen with cooking equipment. Our facilities also include free lockers, free bed linen and towels, free coffee and tea all day long, free breakfast, free WI-FI, free laundry. 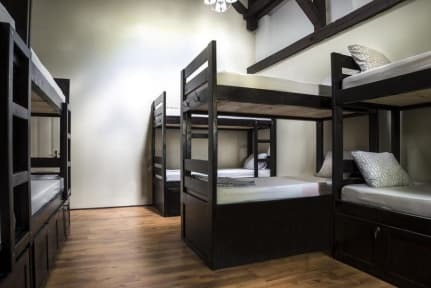 It has a capacity of 30 beds, arranged in two double rooms with private bathroom, one double room with shared bathroom, one 4 bed dorm, one 6 bed dorm, one 8 bed dorm. We have a beautiful outdoor terrace which can accommodate all of our guests. Owned and managed by young people, we designed this hostel together in order to provide you with the best stay. The staff at Antique Hostel can provide you with information on what to see and do, where to relax and also where the best nightlife is. The place to be ! I have great memories there. Near everything : bus to airport, old town, center, malls, banks, shops, anything you could possibly need. The facilities are numerous and the kitchen is big and well furnished, the rooms were also big and confortable. The staff was really cool and helpful, you can ask them about anything. Special dedication to the host of the most, the best hostel manager I've met, Roxana ! ^^ all the best for this year! Will definitely revisit your hostel. Super accueil, le personnel est très bien, à l'écoute, et toujours là pour aider et donner des conseils, pour des itinéraires à suivre. J'ai bien aimé la cuisine qui est spacieuse. Aussi les chambres sont spacieuses et le lit était comfortable. L'hôtel est bien situé. Je le recommande vivement et je reviendrais ici avec plaisir. Merci pour votre sympathie. Ma declar foarte incantata de acest hostel, a fost o sedere foarte placuta, personal amabil, foarte curat, linistit, multiple facilitati , la doi pasi de Centrul Vechi. Il recomand cu caldura si o sa mai revin cu siguranta. Bonne adresse en plein centre de la ville historique ! Staff sympa. Petit bémol: pas de lampe individuelle dans les chambres et très peu de prises ! Emplacement parfait en plein centre ville. Cuisine très bien équipée. Seul bémol, les douches communes...elles sont mixtes et y a pas vraiment d'endoit où poser les affaires pdt qu'on se douche, du coup galère pour se changer, et galère pour pas mouiller la serviette. Une auberge propre et calme, parfaite pour qui cherche la solitude et le silence. Mais ne comptez pas faire de rencontre ici ! Personne ne se dit bonjour et le personnel est d'une froideur incroyable..
Cette auberge est situé à l'entrée du quartier des boites de nuit et bar à strip tease... Le personnel est constitué de volontaires certains adorables, d'autre dont la priorité n'est clairement pas de renouveler le stock de savon ou papier toilette. L'avantage est le balcon et la machine à laver. Horrible staff!!! !no one at the reception (bad for security), she couldn't make the check in properly, got mad for anything (she throw up a guy's stuffs on th ground because he changed his bed without asking), when we asked for train information, another girl told us to look on google (!!!). The personal is literally a shame!! Same for the cleaning ladies who can not stop looking at us. I would like to put a 0 to this guesthouse although many things are nice (location, terrasse...). Jai pas aimé la façon ou la manière dont le gars de la réception par au gens! Il a même essayer de prendre mon argent ! Il croyait que je suis nul en math et que j'allais laisser passé tout ça! L'hôtel est propre mais y'a pas d'ambiance, pas de chance ni de contact avec les gens qui séjournent là-bas contrairement à d'autres endroit sur Bucarest !! !